Recently I cleaned out my freezer and found a little bit of this and a little bit of that. I had a small amount of shrimp, lagostino tails and an odd package of chicken thighs. So I decided to put it all together in a spicy gumbo which is one of my favorite one pot wonders. It makes a complete meal ladled over sticky rice with a crusty slice of french bread on the side. Traditional gumbo includes a holy trinity consisting of chopped onion, celery and green pepper, however I make mine with a duo of onion and red bell pepper. I’m just not into celery and green bells. However if you like them, throw them in too and just cut back on the onion and red bell. 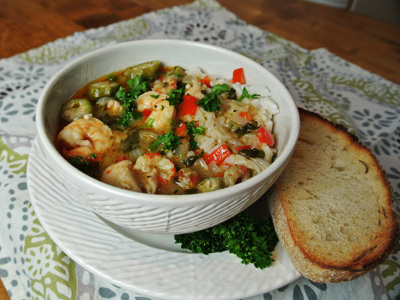 It’s hard to find the Southern tastes of New Orleans here in KC but having a bowl of gumbo takes me there! This recipe has a lot of ingredients, but don’t let that stop you. It’s really easy once the prep work is done. 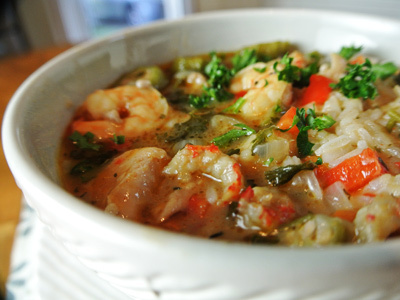 You’ll need 2 pounds of any combination of chicken, seafood or sausage, chopped onion and red bell pepper, some okra and fresh parsley. You’ll also need chicken broth, worcestershire sauce, red pepper sauce and a spice blend that I’ll break down later. First part is making the roux. In a pre-heated dutch oven add 1/2 cup of vegetable oil. 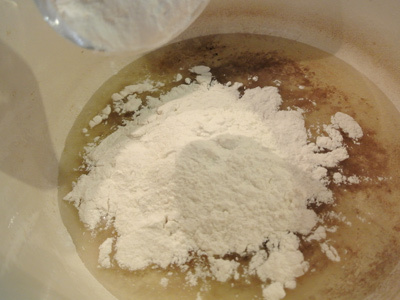 Add the same amount (1/2 cup) of flour to the oil and stir to incorporate. 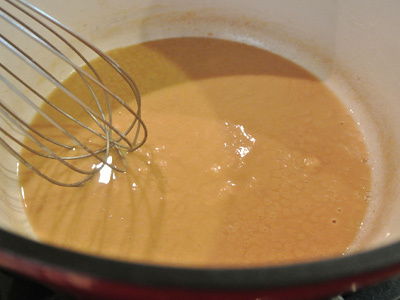 Stir the pot and cook over medium high heat for 15 – 20 minutes until the roux turns a copper color. 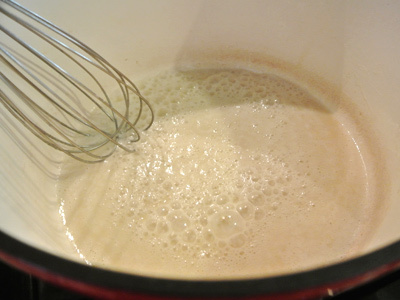 You will need to stir continuously so that the roux doesn’t burn. It’s starting to turn brown but not quite dark enough. Just takes a little more patience and stirring. About 20 minutes in, I have the color I want. You could go darker if you like, just make sure not to burn the roux or you will have to start over. Yes, that has happened to me! 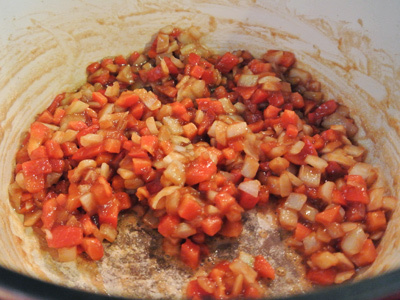 Add your chopped onion and red bell pepper. Or if you choose, some celery and green bell too. Cook for another 7 – 10 minutes while the veggies sweat it out and when they become soft and translucent, add the garlic. Stir the pot a minute more. 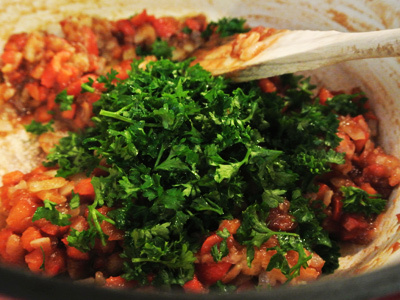 Add the chopped fresh parsley. And 4 cups chicken broth. Toss in all the spices which include a bay leaf, paprika, dry mustard, cayenne pepper, white pepper, garlic powder, onion powder, oregano and thyme. 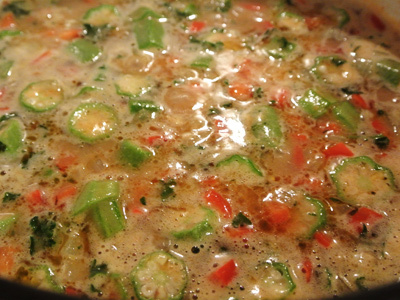 Add the diced okra and bring to a boil. Add the 2 pounds of meat to the pot. 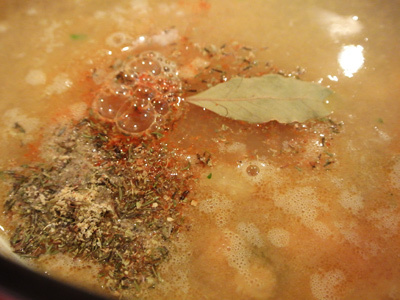 Simmer for 10 – 15 minutes, stirring occasionally. Ladle over white steamed rice and serve with a slice or hunk of french bread. 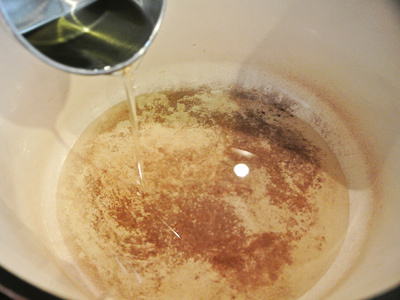 In a 5 quart or larger dutch oven, combine vegetable oil and flour. Stir the pot over medium high heat. 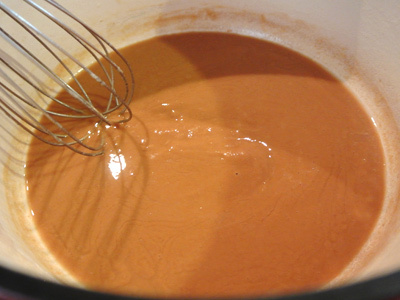 Continue cooking for 15 – 20 minutes while stirring the pot until the roux turns a dark copper color. 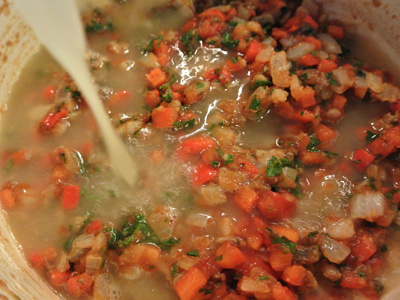 Watch the roux closely and continue to stir or the roux may burn. 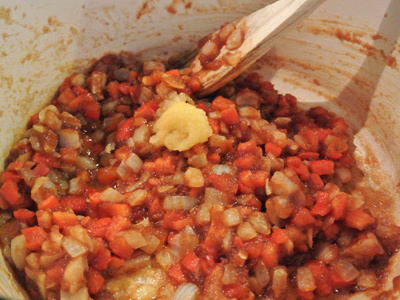 Add the chopped onion and red bell pepper to the roux. Stir the pot and let the veggies sweat it out for 7 -10 minutes. When the vegetables are soft and translucent, add the garlic and stir for 1 minute more. Next add the fresh parsley and pour in the chicken broth. 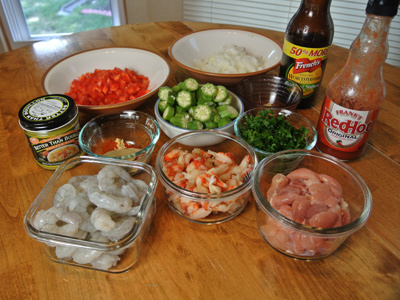 Turn up the heat and add the remaining spices, worcestershire sauce, red pepper sauce, okra and meat combination. Bring just to a boil, then turn down the heat to simmer. 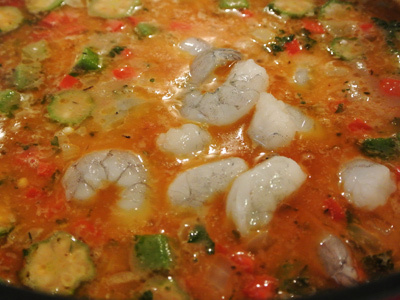 Place the lid on top and simmer for 10 – 15 minutes. Ladle over steamed rice and serve with french bread.